Strangers make all sorts of assumptions from a person's appearance. A woman with styled hair and a powersuit looks more like an attorney than the woman with a sidebraid and a sundress. Similarly, no one takes the man with shaggy hair and three days' beard as seriously as the clean-cut man next to him. It's even more prominent when weight is added to the equation. Being overweight has connotations of laziness, a lack of willpower, a lack of self-respect. And it's a self-fulfilling prophecy. As the opinions of people become internalized, it becomes more and more true. This is the trap in which Noko finds herself in Moyoco Anno's In Clothes Called Fat. Noko is living a life that seems exaggerated to others, but rings true to anyone in her position. Working in an office staffed by pretty women in their 20s who still live at home and have their whole paycheck to spend on pretty clothes and going out, Noko is the outcast of the office. Called 'pig' by her superiors, mocked for her underclothes by her coworkers, all she has for comfort is food. And her boyfriend Saito. But when one of the girls at work crosses the line, and Noko discovers Saito at Mayumi's apartment, all bets are off. And when Noko comes into a large amount of money unexpectedly, the obvious use for it is to lose the weight that has made her more and more of a target for this torture. Then again, when the only thing a person has control of is their food, everything else slowly spins out of control. As Noko turns to dangerous means to attain the physique she wants, and Mayumi continues her campaign to destroy her, will she lose more than just the fat? 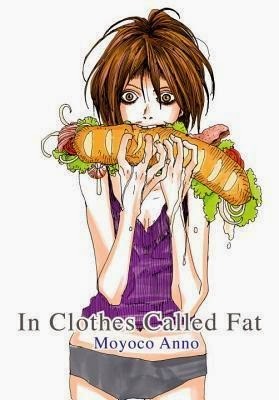 The art of In Clothes Called Fat tells as much of the story as the text. Even in her early fantasies, being thin is always equated with having pretty clothes and perfect hair. The thinner Noko gets, the more tired and haggard her face gets. Rather than becoming more pretty, she uses more and more makeup to hide the circles under her eyes. Moyoco Anno has written an insightful tale of the ptifalls of society's shallow view of people, as well as the insecurities of those of all walks of life. Whether a top trader, or a beautiful secretary, or a lost soul, there are no pretty people in this book. Highs: Anno shows a remarkable understanding of the insecurities - and their roots - of a wide swath of society. Lows: There really isn't anyone to root for in this book; every last person is a broken, irredeemable mess. Verdict: With no 'good guys' and few happy moments, In Clothes Called Fat leaves the reader with a bleak, if honest, look at society's failings.